Before Oprah’s alarming 2013 interview with Lance Armstrong, in which he tells the world he lied and actually did use performance-enhancing drugs during his seven Tour De France race wins, there was Alex Gibney, an Academy Award-winning director (We Steal Secrets: The Story of WikiLeaks). You see, in 2009, Gibney was hired to direct a documentary film that centered on Lance Armstrong’s comeback. Shortly after Gibney’s Armstrong film, titled The Road Back, was completed, Gibney needed a new title, and he also needed more footage to cover the doping scandal that was unfolding. In The Armstrong Lie, we are given not only front row seats to witness an American hero’s climb to fame, we also see his fall from grace. Armstrong lies countless times to friends, family, sponsors, press, fans, and basically anyone who had the nerve to question him about the banned drugs. And what’s most disturbing in the film is the manner in which Armstrong lies; he displays an incredible amount of self-assurance and arrogance – he’s chilling to watch. At times, he lies casually with somewhat of a smile; other times with firm cheekiness or angry sneers. Regardless, he has become a master at it. 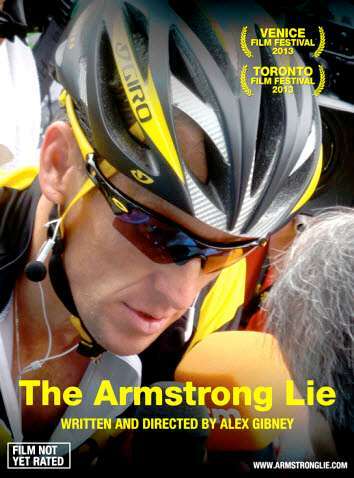 The Armstrong Lie is not just a film about a fallen sports hero. It also covers the sport of bicycling via outstanding cinematography, using ten different cameras, while enlightening viewers about the rigors of the world’s most grueling and challenging three-week sports event – the Tour de France. Gibney also looks at the idea of belief. Why was the public so willing to overlook Armstrong’s deception? Perhaps it was because Armstrong was a cancer survivor, and the world loves an underdog story? Or, was it that we wanted to believe the beautiful lie more than the ugly truth? What does this say about our nation’s desire to win at all costs? We are given an Armstrong chronological history. First, as a desperately competitive, angry teen, one who simply wanted to beat his fellow classmates. Raised in Texas by a single mother who struggled financially, it wasn’t so much that he wanted to win – to him, losing was death. The film also follows his rise to fame during all of his bicycle competitions and his struggles with cancer, even chronicling the grueling chemo regimen to an eventual cure. There’s a heroic story here, and this tale did lead to the formation of Livestrong, the organization that supports those with cancer. Through the foundation, Armstrong was an inspiration to so many— yet he continued the lie. The film asks many questions. Should Armstrong be pardoned? After all, he did help so many. During my interview with Gibney, I asked him why he thought Armstrong turned into such a bully when trying to protect the lie, yet here was a man that had helped so many people. Gibney surmised that in Armstrong’s mind, because of all the good he had done, it was okay, that all of his good erased all of the bad. Whether or not you are a sports enthusiast, you will find that this film is one of the best documentaries to be seen in years. Gibney has captured incredible footage of Armstrong’s life by having carte blanche access to him. Bottom-line: I’d recommend this film to anyone over 17 as it’s a very well made film that and holds your attention. Just know that it’s a bit long…just over 2 hours.